The purpose of this test is to determine the effects of a substance on the growth of freshwater microalgae and/or cyanobacteria. Exponentially growing test organisms are exposed to the test substance in batch cultures over a period of normally 72 hours.The system response is the reduction of growth in a series of algal cultures exposed to, at least, five concentrations of a test substance. Three replicates at each test concentration should be used. The response is evaluated as a function of the exposure concentration in comparison with the average growth of control cultures. The cultures are allowed unrestricted exponential growth under nutrient sufficient conditions (two alternative growth media: the OECD and the AAP) and continuous fluorescent illumination. Growth and growth inhibition are quantified from measurements of the algal biomass as a function of time. The limit test corresponds to one dose level of 100 mg/L. This study includes: the determination, at least daily, of the algal biomass; the measure of the pH (at the beginning and at the end); microscopic observation. 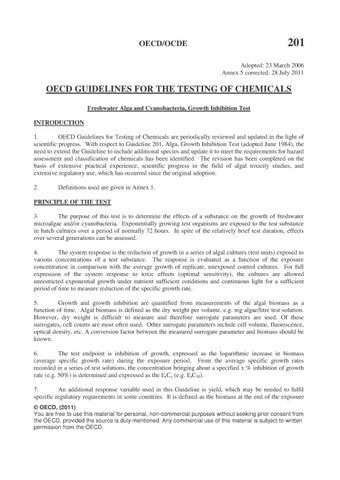 This Test Guideline describes two response variables: average specific growth rate, and yield.